Yes, it's time to renew your waiver. Our waivers expire after one year. 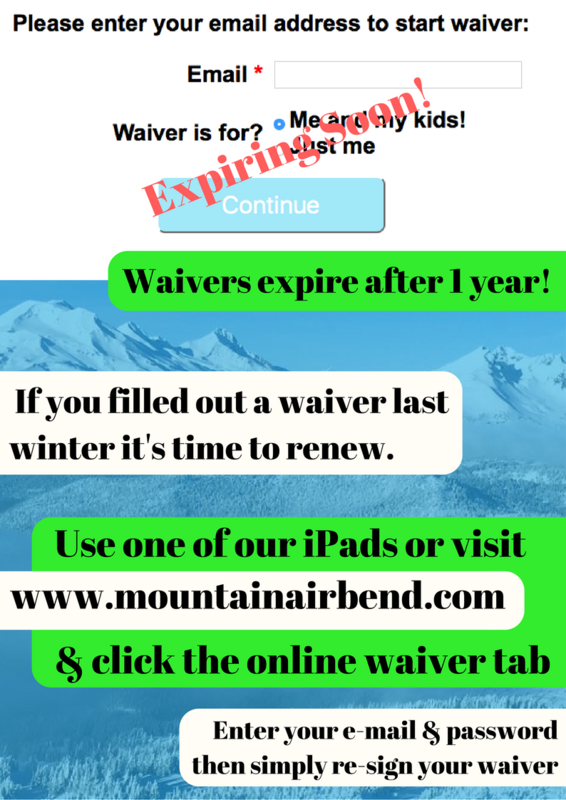 The simple and easy way to renew your waiver is by going to mountainairbend.com clicking on the Online Waiver tab or button on our homepage, entering in your e-mail address and password, then simply resigning your waiver. And now it's good for another year. What to do in Bend when the temperatures start to drop and the snow begins to fall? Central Oregon offers a multitude of outdoor sports, but lets face it, spending an hour bundling up the children just in time to get them ready for snack and a nap can get a littler tiring. 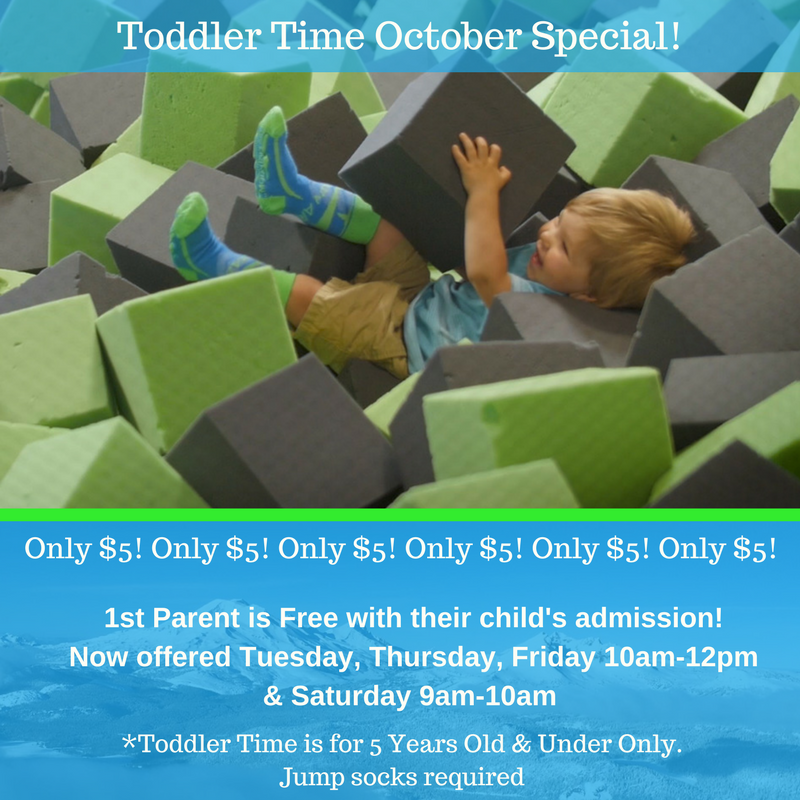 This October we are offering our regular Toddler Time, but are adding Tuesday and cutting the price in half, to just $5, and one parent is free with their child's admission. We want to give back to the community that has supported us. So come jump, get a cup of coffee and a pastry in our cafe, catch up with friends, get some work done on our free wi-fi, spend time with your kids, and do it all for just $5. Mountain Air is offering a summer sensory hour for our Central Oregon special needs community. Sensory Hour is currently every Wednesday from 11am-12pm. Admission is $10 and their is no charge for parents caregivers or support personnel. Admission is only for those actively participating in jumping. We think it is important for Bend area businesses to offer events for all members of the community. We have had numerous parents let us know that Sensory Hour offers a way for their family to experience Mountain Air Trampoline Park in a way they never could before, and for some, it is the only time they can access the trampolines due to extremely limited mobility. Ultimately it brings us a great sense of joy to people smile and families play together. So if you or someone you know can benefit from Sensory Hour we hope to see you soon. *Update - We are now offering our Sensory Hour the last Wednesday of each month this fall! 9/27, 10/25, and 11/29 from 11am-12pm! Nothing beats summers in Bend, OR. Looking for something to do amidst the outdoor fun Bend has to offer? Come down to Mountain Air during our summer hours. We open up our garage doors to let the sun in, offer local craft beer, cider, and wines for adults, and provide fresh brick oven pizza from The Backyard, one of the best pizza restaurants Bend has to offer! This summer we will be open 12pm - 8pm Monday through Thursday, 12pm-10pm Friday, 10am - 10pm Saturday, and 12pm-8pm on Sunday! And we will be offering Toddler Time Thursday and Friday from 10am-12pm and Saturday from 9am-10am. A great opportunity for family fun in Bend any day of the week, all summer long! Come jump. The air is better up here! Here at Mountain Air we are constantly looking to improve guest experience and add new and exciting attractions. Starting in July you will be able to crawl inside one of our giant hamster balls! Whether you're a grown adult or a tiny tot, you will have the opportunity to roll, play, and bounce in a whole new way. We just couldn't wait to share the news. Hamster Balls at Mountain Air! A brand new way to experience the adventure that Bend has to offer. That's right! You come and jump pretty often don't you? So why not get a bit of a reward back? With Mountain Air Bend's AirClub now you get all that and more. For each jump you purchase you get one stamp, after ten stamps you get a 90 Minute Jump for FREE!!!!!! On us, as our way of saying the Air is Better Up Here!!!! Purchase your next jump now and get started on that newest AirClub card! *AirClub may not be used with Toddler Time, Birthday Packages, and Private Events.